Two for the price of one: more about karate "blocks"
Those of you who have read my article on Why blocks DO work will recall that I mentioned there that every basic block in karate contains 2 movements - the primary block (a larger movement) and a secondary block (a smaller movement) in the "pullback" arm (what some people call the "crossing hand"). I am astounded as to how few karateka today are actually aware of this fact. So what is the function of these 2 movements? Well first, the secondary movement can operate as a deflection entirely on its own. While the move is generally smaller and weaker than the primary movement it can often intercept the attack sooner. And executed correctly it can be just as effective. 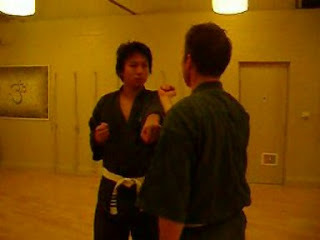 Consider the pictures to the left of the secondary movement in goju-ryu's chudan uke (chest-level block). Just as the primary movement comprises a circular deflection, so the secondary movement also deflects with a circle (albeit smaller) on the same angle. Last, and most importantly, what is also highlighted in this video is that the secondary movement does more than just start the deflection. Rather it acts as a kinaesthetic feed into the primary movement. In other words the initial contact gives your body the necessary feedback to more correctly utilise the primary movement in the deflection. Kinaesthetic feedback in martial art occurs predominantly via sight - but the next most important is touch. There are of course many drills aimed at building this "touch sensitivity" - including the drill below which utilises primary and secondary deflections from goju-ryu's tensho kata - in particular the complex mawashi uke (roundhouse block) - a block that has multiple "parts" and not just 2. Now I mentioned above that the chudan uke's secondary movement was unlikey to be used as the sole deflection; it is more to be used as a back-up or a "kinaesthetic feed". This is because the chudan uke is primarily intended as a deflection against straight line attacks. However when we come to its more advanced cousin, hiki uke (the open hand "pulling" or hooking block - also known as "kake uke") we see a different picture. Yes, the hiki uke's primary movement is intended as a deflection against straight jabs, for example (again, see my article Why blocks DO work). But the secondary movement is also ideally designed to be used against curved backhand strikes such as the hammer fist and uraken (backfist). This is in line with the principle that a straight attack should be deflected with a a circle, while a circle should be deflected with a straight line... Consider the pictures to the left illustrating the hike uke when used against the backfist strike. The secondary hand intercepts, transferring to the primary hand for control while the secondary hand then counters with a backfist of its own. Last I mention for the sake of completeness that the secondary movement can be used as the main deflection while the primary movement is used as an attack. While this might a valid occasional use of the constituent elements of karate blocks, I feel it is somewhat overstated. Certainly it can be seen in the hiki uke, for example (see the pictures to the right where instead of using the primary movement to control my opponent's arm, I've converted it to a backfist). It is however more commonly argued in the case of the humble age uke (rising block) also know as jodan uke (head-level block). I have covered this briefly in the video below. I'd also like to offer the experience that as training has progressed and my muscles have begun to tire, it becomes harder and harder to get the primary block of chudan uke as the main deflection. The more tired I get, the more I rely on that secondary block to buy me a split second so I can get my defence up properly. Also, those tensho kakie drills look amazing! I can't wait to practice them! The longer I train, the more I learn. How wonderful to not become stagnant, stuck in the same ignorances and misconceptions!